Ideal clients are really cool. And best of all – they are also your biggest fans. They will happily help you attract even more of the same kind of client. 1. Know who your ideal client is. You can do that by filling out an ideal client questionnaire. Feel free to use the one I’ve linked to, which is a compilation of what I find are the best questions to ask yourself. Unless you have already defined a target market, you might also want to check out this post about market research where the topic of target market and ideal client is covered in step 1. Are they Facebook people, or LinkedIn people? Are they active in certain groups or forums online? Are they going to specific events or activities? Wherever they are, you should also be there – chatting with them, bringing value, letting them know you exist and what you do! And remember: Be a friend, not a sales person. What does that even mean? This is where little bit of magic happens. When you write your website content, your blog post or social media post, then don’t think about writing to a huge crowd of blurry faced people. Think about: How you would express yourself if that person (your ideal client) sat in front of you? What you want to avoid is to talking with a too professional facade, trying to sound impressive, trying to (desperately) convince people that you are the one for them. If they sense that you are a like-minded person, who understands them, and have the skills and knowledge they need, they will naturally get attracted to you. Your authentic self, more than your impressive achievements, will attract your ideal clients, . 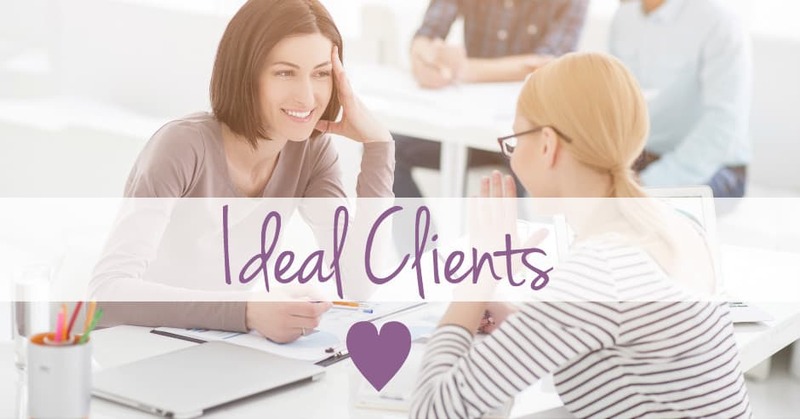 What’s your take on ideal clients? Have you had to work with clients that make you feel bad? Leave a comment to share your experience or opinion! Yes, relationship building and research! Ideal clients take time to develop and then I find, it is important to know who you don’t want to work with too! Great tips and reminders. Thanks ! You are right, it takes time to develop, especially in the startup of a business. The more clients you get, the more it gets clear who are the ideal ones and the characteristics that make them ideal. I particularly like #3. If you communicate with them like a real person, they will relate, and a great working relationship grows from there. This is one of your greatest strengths, Vibeke! Thank you Debbie, and yes, it’s also the most rewarding working relationships!